On August 16, 2015, Mobile resident Misty Malik was in Jackson to celebrate her grandmother’s birthday, She booked a room at the La Quinta Inn on I-55 because it allows dogs. 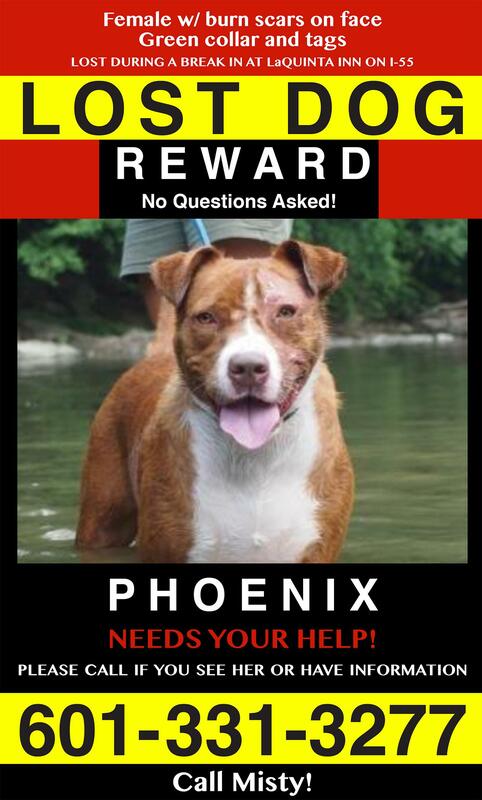 Misty has a beloved rescue named Phoenix, a large red and white pitt mix with a burn scar on her face. She was adopted from the Peacable Kingdom rescue in Philadelphia, Pennsylvania. While Misty was at dinner, she got a call from the hotel. Her room had been broken into and her dog had been let out and was last seen running away from the hotel. Since then Misty and volunteers have searched for Phoenix. Misty has returned several times from Mobile. There have been sightings in N.E. Jackson and posters have been placed in all of these areas. But it has been a week without a sighting so we’re exploring the idea of hiring a professional dog tracker. A friend of mine used one years ago to find her borzoi missing in D.C. and last week a small terrier was reunited with another family in North Jackson with the assistance of a professional. I’m asking for donations. Here’s the gofundme site. And here’s the facebook page where you can get updates on the search.